I’m not going to lie to you – I think this might be the recipe that I’ve been most excited about in quite a while. Chicken. Bacon. Ranch. Salad. 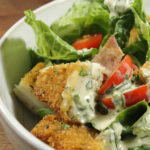 A delicious, creamy salad dressing filled with herbs is perfect on a salad topped with crispy chicken breast. 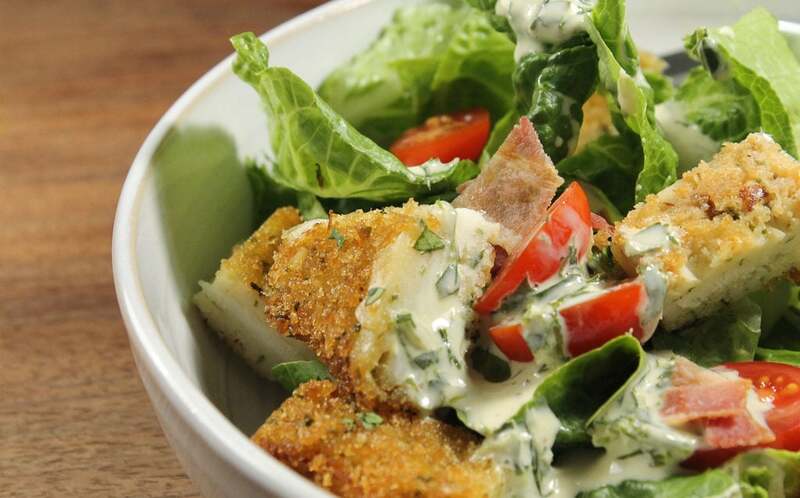 Crumbled bacon adds saltiness that compliments the crisp greens nicely. We’re expanding into the keto world – after being strictly paleo for years and years now. And that allows room for some recipes + ingredients that we haven’t been able to share with you before. If you’re trying out this keto lifestyle, keep an eye out for all of our new keto content. Check out our comprehensive guide. Our keto calculator is helpful for calculating your keto macros. We even have keto meal plans if you want the majority of the planning work done for you. Combine the almond flour with the seasoning in a small bowl. Dredge the chicken in the egg, followed by almond flour mixture. Heat the oil in a deep skillet over medium high heat and cook the chicken until well browned on both sides and cooked through. Set aside. To make the dressing, put all of the ingredients in a jar and shake until well combined. Chop the chicken and add it to a bowl with the lettuce, tomatoes, and bacon. Toss with the dressing before serving.